Starring: Sally Field, Lindsay Crouse, Ed Harris, Amy Madigan, John Malkovich, Danny Glover. Plot: Product Description: Unsentimental memory piece about growing up in a small Texas town during the Great Depression. Focusing on a young widow who suddenly has to support her two young children, the film celebrates the community she gathers around her: a black hobo who begins as a thief and winds up as a friend and mentor; a cranky blind boarder; a pragmatic sister who is supporting her own family, including a husband with a penchant for her best friend. This is a film that of pure Americana, and a powerful example of storytelling. Written and directed by a truly gifted man, Richard Benton. Benton took an emotional subject and created the dramatic world, and ultimate ordeals of pain and suffering, and the will to succeed no matter what. Benton captured a true sense of life. The movie comes off as a piece of flawless literature, but in filmed form. The characters are imaginative and downright memorable to a flawless degree. A widow trying to save her farm and feed her kids, a Black Hobo, an angry blind white man, a sister and her problems all come off in a fantastic creation of emotional beauty. This displays the will to live, and to fight for the will to strive in depression era sufferings. Twilight Time has honored this piece of cinema with a lovely Blu-ray release. This is a 1984 classic that I have often felt, has been over looked, and much under-appreciated. Places in the Heart is a stunning piece of cinema with extraordinary acting, directing and utterly fantastic cinematography. The cinematography is breathtaking. Nestor Almendros captured images and beauty like a masterpiece on canvas. This film has some of the greatest cinematography. Nestor also did one of my other favorite films of all time, the stunning, Terrance Malick’s Days of Heaven. His eye for beauty, uniqueness is award worthy. Places of the Heart is a prime example of the art form of film making through his cinematography. Almendros captures flawless brilliance with Places of the Heart. Directed by a director that knows the imagery to capture, to create memorable pieces of cinema. He not only is a director, but he is a dynamic writer. He penned the amazing films, 1967’s Bonnie and Clyde, the fun superhero film, 1978’s Superman, and the award winning, 1979’s Kramer vs. Kramer which he also directed. He has created many pieces of cinema showcasing his brilliance and expertise in crafting films that matter. 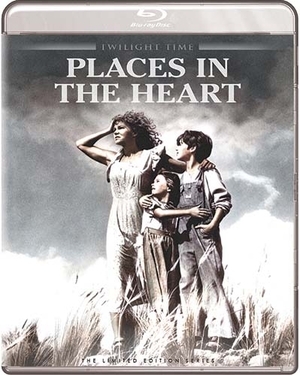 Places of the Heart was nominated for 7 Academy Awards and won 2 of them. Sally Field won her second Oscar for Best Actress for her role in Places of the Heart. She deserved it. She created a breathless reality of performing. Fields is one of those magical actresses that is pure cinematic history. Places of the Heart also won for Best Screenplay. It’s a film that deserved all the accolades given to it. I think what ultimately needs to be showcased is the cast. An unbelievable mix of acting perfection through many styles, and performing mastery. As mentioned the talented Sally Field. Also the performance by Lindsay Crouse. Crouse is a performer that I have often felt has never gotten the limelight she so deserves. She is the very definition when it comes to the art form of acting. She is always so interesting and unique in her persona's of characters, and the character of Margaret Lomax in Places of the Heart is no different. Also Places of the Heart has three master talented actors, Danny Glover, John Malkovich and Ed Harris. All three own their parts. Create memorable characters. They own each shot they are in. That is what makes this film stand out the most, is the chemistry between all the performers. It seems real, and is flawless to watch. An emotional, dramatic storytelling of cinema perfection. A beautiful piece of American cinema. Twilight Time has created another flawless product. An amazing Blu-ray that stands out. High quality in all aspects. The beauty of Nestor’s cinematography shines on this high class Blu-ray. Another amazing transfer in video to Blu-ray. Audio equally impressive. Truly another stunning experience to see a film treated the way it should be treated. Twilight Time honors film with high class transfers and top quality sound. Isolated score track. This is a great little special feature. The music by John Kander is always a treat to hear. He was responsible for many memorable numbers in countless pieces of musical cinema, such as the amazing 1972’s Cabaret, 1977’s New York, New York, 2002’s Chicago and many others. His amazing career has spanned many arrays of cinema and theater. From stage plays, to musicals, to composing for film. He leaves a lasting impression on the viewer through his music. He not only did Places of the Heart, but also composed music for other Benton films such as, Still of the Night, Kramer vs. Kramer, Billy Bathgate. Kander knows music in cinema, and this special feature is brilliant for music lovers. You also get an amazing Audio Commentary with the very talented, and absolutely stunning Sally Field, and the amazing film historian Nick Redman. This special feature is Willy Wonka’s golden ticket of perfection. Hearing Sally Field is dynamic. Also you get the wonderful Booklet insert written by film historian Julie Kirgo. An all-star cast. Powerful direction. Stunning beauty in cinematography. Dynamic music. All this equals a flawless film to be honored, awarded, talked about, viewed and given this amazing new outlet on Twilight Time Blu-ray. Brilliant product. Perfection in Blu-ray quality. Make sure you head over to www.screenarchives.com to buy all the wonderful Twilight Time Blu-rays. The main page that gives you these beautiful releases on top quality Special Editions.